A Partagás Habano is immediately recognized by its rich and intense flavor. The Serie E No.2's huge ring gauge has made it an instant hit among modern aficionados. The warm start quickly accelerates in the realm of intense, dark flavors. Leather, earth and rich wood are present in bucket loads. Watch out for a strong finale. Big in the hand and dark in the wrapper. 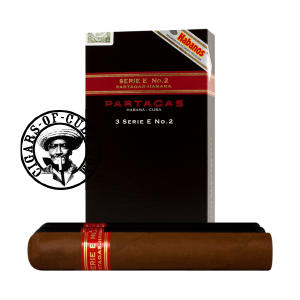 You know you are going to enjoy a Partagas cigar. Earthy flavors with hints of exotic spice are present in the first and second phase of this cigar. A gradual build in power is felt throughout the second phase. Very strong and intense finale. In its younger years, this finale may be overpowering, but with time it will find balance. The Tubos makes of this cigar the perfect companion to take out with you.